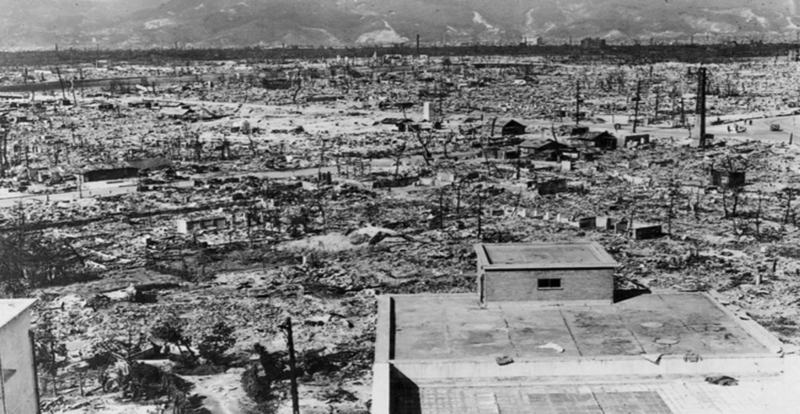 The first atomic bomb was dropped by the United States on the Japanese city of Hiroshima on 6 August 1945. Three days later the second was dropped on Nagasaki. Hundreds of thousands of innocent civilians died and countless more had their lives blighted by the horror, by sickness and by loss. The Atomic Age had begun. During the late 1940s and 50s, first the US, then the Soviet Union and Britain developed and tested new atomic weapons with ever increasing frequency. Not only were there fears of nuclear war breaking out but there was growing concern and protest around the world at the health risks and environmental damage caused by these atmospheric tests. By the late 1950s, these fears had become acute. In the 1950s Europe was gripped by a very real fear of nuclear conflict and, building on the work of earlier anti-war movements, CND was launched with a massive public meeting in London in February 1958. 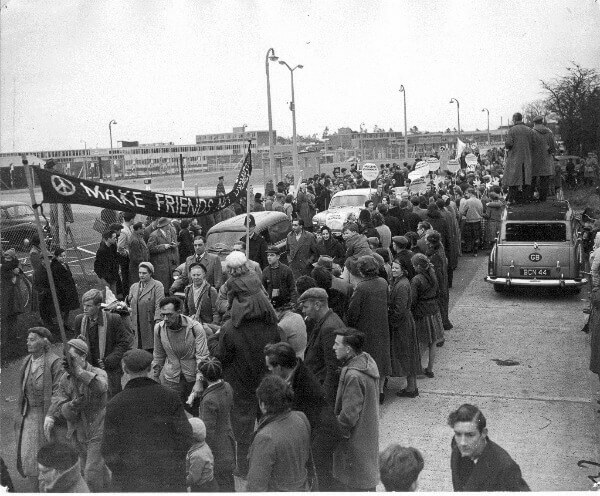 Shortly afterwards at Easter the first Aldermaston March attracted a good deal of attention and the CND symbol appeared everywhere. From the outset people from all sections of society got involved. There were scientists, more aware than anyone else of the full extent of the dangers which nuclear weapons represented, along with religious leaders such as Canon John Collins of St Paul’s Cathedral, concerned to resist the moral evil which nuclear weapons represented. The Society of Friends (Quakers) was very supportive, as well as a wide range of academics, journalists, writers, actors and musicians. Labour Party members and trade unionists were overwhelmingly sympathetic as were people who had been involved in earlier anti-bomb campaigns organised by the British Peace Committee or the Direct Action Committee. In the early years membership increased rapidly. 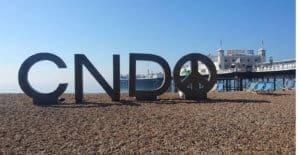 CND’s advocacy of unilateral nuclear disarmament – the proposal that Britain should take the initiative and get rid of its own nuclear weapons, irrespective of the actions of others – caught the imagination of many. Multilateral disarmament – simultaneously by negotiations between countries – was clearly not working, although CND also strongly supported the goal of global abolition. The US, Soviet Union and Britain, (and later France and China), were building ever more nuclear weapons. All attempts to control, let alone reverse the process broke down repeatedly. (As an example, negotiations for a treaty to halt the spread of nuclear weapons began in 1958 but the final agreement was not reached until 1968). In 1962 the Soviet Union was discovered to be installing nuclear missiles in Cuba, only 90 miles from the Florida coast. This very nearly provoked a nuclear war and although the Soviet Union pulled back at the last moment, both sides had been severely frightened. The first telephone hot-line was set up between Washington and Moscow so the leaders could talk directly to each other. The Soviet missiles were taken out of Cuba and shortly afterwards US missiles already based in Turkey were quietly removed. The next year a ban on nuclear testing in the atmosphere was agreed between the US, Soviet Union and Britain. For the first time the multilateral approach seemed to be working. International tension relaxed as the immediate threat of nuclear war faded away and CND numbers began to dwindle. From the mid-1960s, nuclear issues were increasingly replaced as the subject of mass popular protest by anger over the United States’ war on Vietnam. CND continued but as a much smaller movement. But protests continued, particularly in Scotland where British nuclear-armed submarines were now based. During these years, CND faced significant political challenges. Many CND supporters were Labour Party members and when CND’s unilateral line gained majority backing within the Party, it provoked a violent reaction from the leadership. When Harold Wilson won the 1964 Election, the new Labour Government simply ignored anti-nuclear feeling and continued with the previous Conservative Government’s nuclear policy. There had also been internal arguments about whether it was ever legitimate to break the law. Supporters of non-violent direct action (NVDA) wanted the campaign to include mass civil disobedience actions such as sit-ins and blockades. 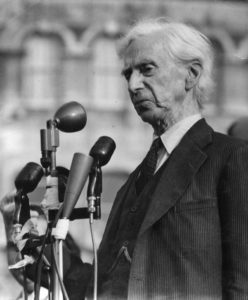 In 1960 the Committee of 100, led by the philosopher Bertrand Russell, was set up to organise mass civil disobedience. In February 1961 4,000 protesters sat down outside the Ministry of Defence in Whitehall. In September, 1,300 were arrested in Trafalgar Square and 350 at Holy Loch in Scotland where the UK nuclear submarines armed with US-loaned Polaris nuclear missile were based. The authorities began to arrest and imprison the organisers (including the 89-year-old philosopher Bertrand Russell). There was strong support for the Committee of 100 among CND members but some of the leadership refused to accept any illegal activities. The whole legal versus illegal debate is not a simple matter of the authorities (legal) against the demonstrators (illegal). The police, local authorities and even the state can act illegally or at least stretch the law in ways never intended. Many people also argue that it may be necessary to commit a lesser crime in order to prevent the greater one of nuclear war. 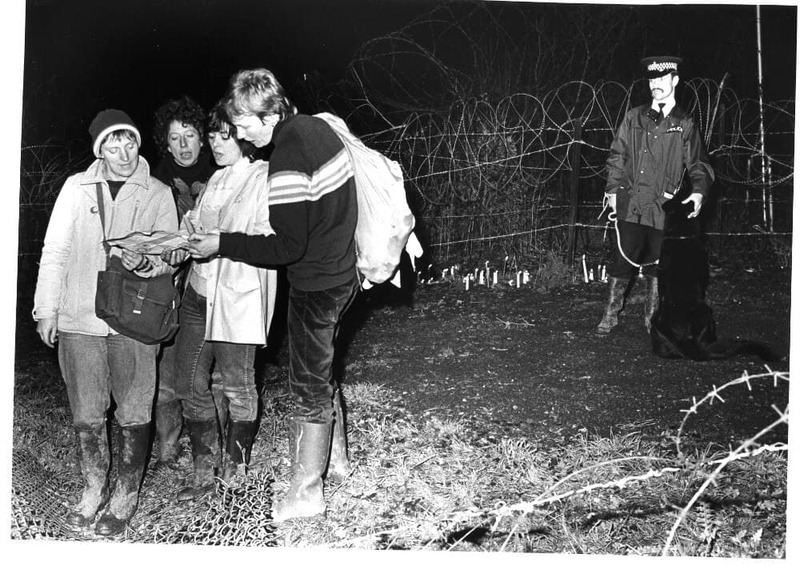 The principles and practice of NVDA were worked out in detail during this time so that when direct action came to the fore again in the 1980s, it was generally accepted by the peace movement as a legitimate form of protest. In 1979 the decision was made to deploy US Cruise and Pershing missiles in Britain and several other Western European countries. At the same time the Soviet Union was deploying its new SS-20 missiles in Eastern Europe. Suddenly the nuclear threat was back and talk of nuclear war commonplace. As more and more missiles were crowding ever closer to the East/West border, US President Reagan and British Prime Minister Margaret Thatcher seemed to have embarked on an anti-Soviet, anti-Communist crusade. Their speeches were full of fundamentalist rhetoric: of Us and Them, of Good versus Evil. People became frightened and many were angry that this new generation of US nuclear weapons was to be based in Europe. Huge protest marches were held throughout Western Europe, and in Britain, CND blossomed. Thousands of new members were joining every month. Cruise missiles were mounted on road vehicles and had to leave their base on regular exercises. Cruise Watch, a network of protesters, was formed to track and harass the Cruise convoys wherever they went. Because of the scale and the determination of the protests, the convoys soon had to have large police escorts and only left the camp under cover of darkness. With huge demonstrations in London and elsewhere, opposition to Cruise and to other aspects of the government’s nuclear policy such as the very close links with the US, had become a major issue in British politics. Renewed ridicule was heaped on the Government’s civil defence plans. 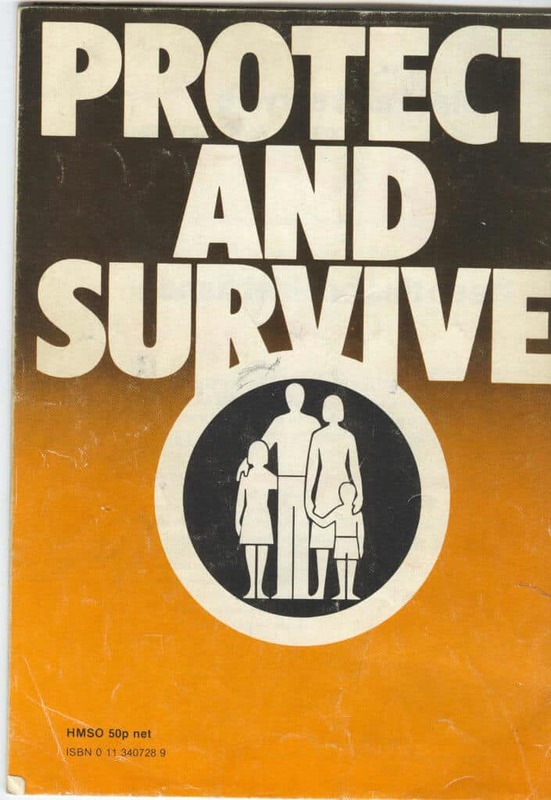 These included do-it-yourself instructions on how to survive a nuclear attack in your own home. Meanwhile a network of underground bunkers had been built, not as mass air-raid shelters but as safe refuges for selected politicians and civil servants in case of nuclear war. Among the many marches and demonstrations, one new element emerged: women-only activities. It quickly became a focus and a symbol of women’s resistance to what many saw as the male-dominated world of nuclear weapons. 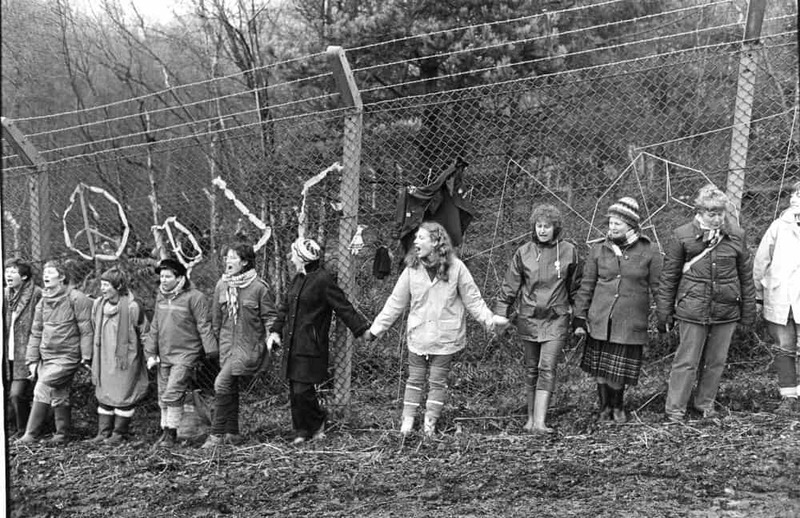 The Greenham Women, as they became known, were independent of CND, although many individual CND women members supported or joined the camp. The Conservative government became alarmed. Michael Heseltine was made Minister of Defence in January 1983. A very important part of his brief was to counter CND’s influence. Not only was a well-funded anti-CND propaganda unit set up by the Government but the Intelligence Service (MI5) began to spy on CND activists: bugging their telephones and even infiltrating an agent into the London office. At the same time several organisations opposed to CND and its policies became very active. Some played a legitimate part – for instance by providing speakers to debate in schools against Youth CND and publishing reasoned arguments in opposition to CND. Others had a less reputable role: disrupting meetings, publishing personal attacks, and attempting to attack and discredit the Labour Party, under the leadership of the staunchly pro-CND Michael Foot, for its renewed anti-nuclear policies. The connections between these organisations and the government and the exact sources of their funding were never quite clear. Then the whole temper of international relations changed. A new Soviet leader, Mikhail Gorbachev, took the initiative in calming the situation. Negotiations to remove the new missiles which had broken down in 1983 were resumed and a treaty signed in 1987. Gorbachev’s reforms led over the next few years to the end of the Cold War, the reunification of East and West Germany, the withdrawal of Soviet troops from Eastern Europe and finally the collapse of the Soviet Union. Again, as people felt safer, CND’s membership began to decline. In the last decades of the twentieth century, treaties covering nuclear proliferation and nuclear testing reinforced the belief that the immediate danger of nuclear war had faded away. Two peaks of renewed popular protest against nuclear weapons however followed the Gulf War in 1991 when there were considerable fears that Iraq would use chemical or biological weapons on Israel, which might then retaliate with nuclear weapons. A second wave of opposition internationally followed the 1995 French nuclear testing at Moruroa in the Pacific. This produced a wave of anger and protest around the world and served as an unwelcome reminder that the world was still full of nuclear weapons and that the development of new ones was continuing. Since the start of the twenty-first century support for CND – and for the UK to get rid of its nuclear weapons – has risen substantially. It is becoming less and less possible to justify the huge costs involved in both maintaining Trident, the current system and building its replacement, in the context of major government spending cuts. However, the Conservative government is committed to replacing Trident, with a final Parliamentary decision expected in the coming months. 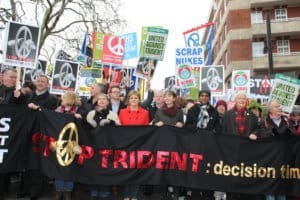 As part of our campaign to Stop Trident and its replacement, CND campaigns both inside and outside Parliament, working with allies and supporters within the trade union movement, faith communities and civil society as a whole. Attitudes are changing across society and within the political parties too. The newly-elected leader of the Labour party, Jeremy Corbyn MP, is a lifelong CND member. The Liberal Democrats have voted to not support a like for like replacement of our nuclear weapons system and the anti-Trident Scottish National Party won 56 of Scotland’s 59 seats in the last election. Polls consistently show a majority for scrapping Trident. Although our main focus is on Trident and its replacement, after the criminal attacks of September 11th, 2001, we vigorously opposed the so-called ‘war on terror’ and the resulting war on Iraq based on trumped-up charges over weapons of mass destruction. We rejected war as a means of solving complex problems and advocated solutions based on dialogue and justice. CND also opposes nuclear-armed NATO and continues to make the links between nuclear weapons and other issues such as missile defence and nuclear power. We also campaign for a global ban on nuclear weapons. CND has continuously reminded politicians and the general public alike about how immoral and destructive nuclear weapons are and how it would be (as it was before) a terrible human tragedy if they were ever used again. We have helped to create an environment in which the use of nuclear weapons cannot be considered. 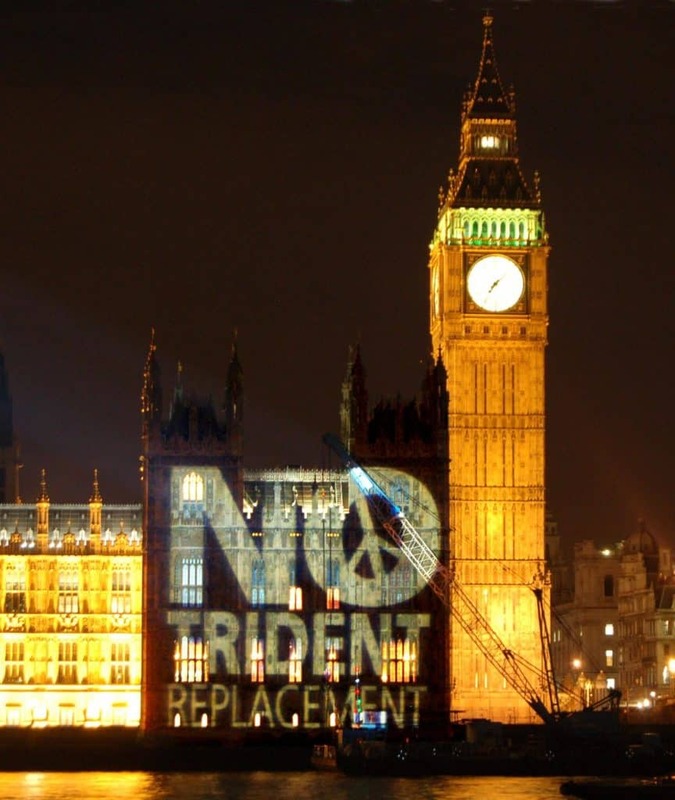 The majority of British people are now against nuclear weapons and it is the same globally. In practical terms we have, working with others nationally and internationally, also been an important force in pressing our government and others to conclude a number of treaties such as the Partial Test Ban Treaty, the nuclear Non-Proliferation Treaty and the Intermediate Range Nuclear Forces Treaty. We also campaigned strenuously against the Neutron bomb; plans for this appalling device were shelved as a result. CND continues to attract strong support from all ages and walks of life and our members – who determine CND’s policy and direction through our democratic structures – are our greatest resource. There are huge amounts of experience, commitment and determination in our campaign and we will continue to work towards our goal until a world free of all nuclear weapons is achieved. With your help, we can do it – join CND today.